That got me thinking. In general, I don’t advocate cutting out entire food groups or foods altogether. Instead, I like to promote the 80/20 rule or “everything in moderation.” I think you can pretty much find a healthier version of just about anything (e.g. 88% dark chocolate instead of milk chocolate, sprouted grain bread instead of white bread, whole wheat pasta or lentil flour pasta instead of white pasta, etc.) I don’t believe in diets, and I don’t believe that entire food groups (e.g. gluten, dairy) are harmful unless you have an allergy or major intolerance to those foods. But, after I received this question I realized while I don’t advocate for cutting out entire food groups, there are certain ingredients in processed/packaged foods that I try to avoid at all costs. And when Mark Hyman reached out to me to chat about some of the advice in his newest book, I thought a joint post with some of his tips and some of mine would be the perfect way to answer this question. 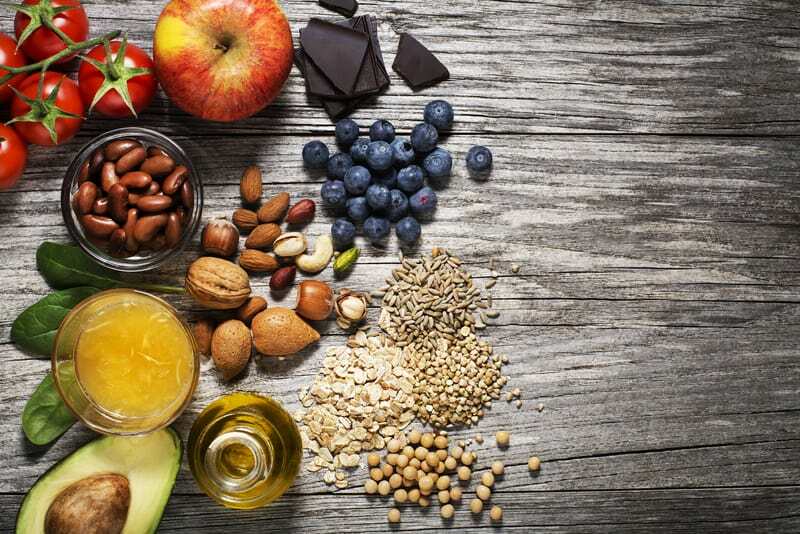 Dr. Hyman likes to call processed foods “Frankenfoods” – that contain things like trans fats, high-fructose corn syrup (HFCS), monosodium glutamate (MSG), preservatives, pesticides, and antibiotics. Why the Frankenstein reference? All of that can be so confusing when you’re trying to figure out what to eat. In general, I advocate for sticking to real food – which lies in the periphery of our grocery stores. Real food doesn’t usually have barcodes or ingredient lists. It doesn’t claim to be “fat-free” or whatever health claims dominate the front of packaged foods. There are no preservatives to lengthen shelf life. They come nature-packaged with nutrients, not produced in labs using inferior versions of vitamins and minerals. When you eat a variety of real foods – things like fresh vegetables and fruits, wild-caught fish, nuts and seeds – you naturally get the right amount of protein, fiber, and other health-sustaining nutrients. Most of what we eat is not “real food.” At least, it has been so adulterated and processed, it is more of a food-like substance. Look at pretty much any processed food and you’ll find dozens of ingredients. The front label might have some bold health claims, but its ingredients show otherwise. As a result, most of us are confused, not knowing whom to believe or what to eat. It can be so frustrating! And while I definitely don’t advocate cutting out all packaged foods altogether, there are 10 ingredients I absolutely avoid if I see them on the label. 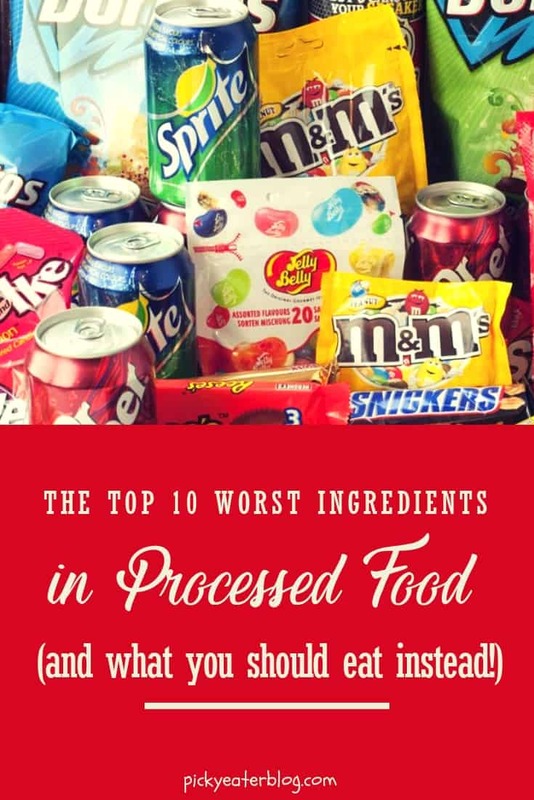 So here it is: My Top 10 Worst Ingredients in Processed Food! #1 | High Fructose Corn Syrup (other names it goes by: glucose syrup, corn sugar, fruit fructose, iso-glucose). What it is: a highly refined sweetener made from corn starch. Why it’s bad: It has been shown to contribute to weight gain, diabetes, cardiovascular disease, arthritis, insulin resistance, elevated triglycerides and LDL cholesterol. It’s found in: Soda, salad dressings, breads, cereals, yogurt, soups, canned vegetables, lunch meats, pizza sauce and condiments. #2 | Trans Fat or Hydrogenated Vegetable Oil (other names it goes by: shortening, partially hydrogenated [soy, palm, corn, etc.] oil). Why it’s bad: Trans fats raise your LDL (bad) cholesterol and lower your HDL (good) cholesterol. They contribute to heart disease, obesity, strokes, and increase your risk of metabolic syndromes. It’s found in: Fruit juices, salad dressings, cocktail mixes, pie mixes, ice cream, candy, bakery products, American cheese, mac & cheese, soda, lemonade, kids’ medication, energy bars, cereal, fast food, frosting, puddings, jams, meat & fish (to make them appear “fresher”) and more! Why it’s bad: Many artificial sweeteners are believed to be carcinogenic, and can contribute to headaches and digestive issues. It also messes with your metabolism and insulin because they trick the brain into forgetting that sweetness means extra calories, which can cause people to actually eat more sweet foods over time! Also, when you eat something that’s artificially sweetened, your body releases insulin the way it would if you actually ate sugar – which messes with your body’s insulin response over time. What it is: MSG is an amino acid used as a flavor-enhancer in processed foods. It is used to make foods more “addicting” to keep you eating/buying those foods! Why it’s bad: Regular consumption of MSG has been shown to stimulate the appetite and contribute to weight gain and obesity. It can also cause fatigue and headaches. It’s found in: Many processed foods like pre-made salad dressings, low-fat flavored yogurt, canned meats, frozen dinners, chips, canned soups, Chinese Food, cookies, seasonings, lunch meats. Why it’s bad: When added to meat (which has amino acids), which is then cooked, these nitrates convert to nitrosamines, which are associated with an increased risk of certain cancers. This conversion usually happens at high temperatures, and the presence of amino acids is necessary as well for the conversion to occur (which is why it’s problematic when nitrates are in meat). In a 2007 analysis, The World Cancer Research Fund revealed that eating 1.8 ounces of processed meat every day increases your cancer risk by 20%. It’s found in: Bacon, ham, salami, corned beef, hot dogs, pate, pickled pig’s feet, canned meat, smoked salmon, dried fish, jerky, lunch meat, cured meats and other processed meats. What it is: These are two preservatives used to extend shelf life and keep foods from becoming rancid. Why it’s bad: Both of these preservatives have been deemed potentially carcinogenic to humans and the State of California has listed them as a known carcinogen. They can also mess with your hormones. It’s found in: Cereals, packaging materials, sausage, hot dogs, gum, chips, beer, butter, vegetable oils, shortening, candy, jello, cosmetics. Why it’s bad: It has been banned in the EU, Canada and several other countries because it has been shown to cause cancer in animals. It is also an endocrine disruptor. It’s found in: Most commercial breads (e.g. Wonder Bread, Home Pride). It’s also common in flour so check the ingredients before you buy! What it is: These are growth hormones designed to boost milk production in dairy cows. Why it’s bad: Milk from cows given these hormones have high levels of insulin-like growth factor (IGF-1). High levels of this have been linked to breast, colon and prostate cancers. Additionally, giving cows rBGH has been shown to increase the incidence of mastitis – which requires high levels of antibiotics to be given to the cows. rBGH milk is not required to be labeled. Why it’s bad: Artificial flavors on their own aren’t harmful, but they are often an indicator that the food is highly processed and likely includes one of the other ingredients on this list! Real food doesn’t require artificial flavoring to taste good it tastes great all on its own! 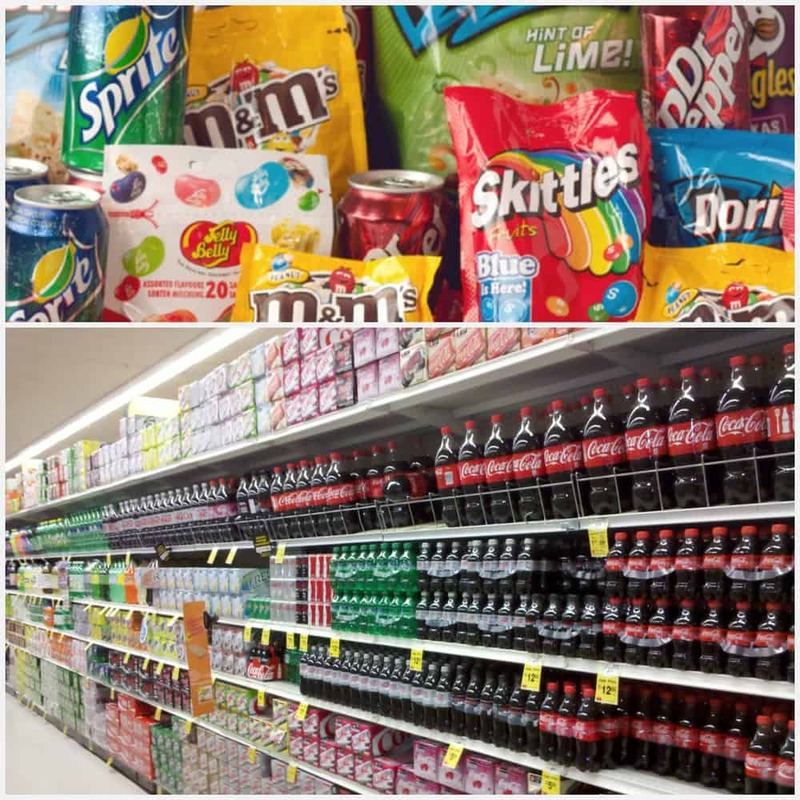 It’s found in: Candy, soda, fast food, and other processed foods. So what should you eat? Stick to whole foods (the perimeter of the grocery store!) and only buy packaged foods where: 1) you can pronounce all of the ingredients on the label (e.g. nut butter should just have nuts and salt listed, nothing else) and 2) none of these 10 ingredients are listed on the label! I hope this list helps you navigate those confusing grocery store aisles, and help you find the healthiest food for you and your family! For more information on which foods are beneficial and which to avoid, check out Mark’s new book — Food: What the Heck Should I Eat? Great advice. In my experience, real food is not only better for you, it also tastes better. Once you get out of the habit of eating processed foods, your palate adjusts and you realize just how artificial and unsatisfying most of those things really are. They’re usually overly sweet or overly salty, and don’t have the depth of flavor that fresh ingredients come together to create! I 100% agree!! Couldn’t have said it better myself 🙂 Thanks so much! Wow! Those ten exist in everything that is processed and some products have several! That’s exactly right!! These 10 ingredients are widespread in processed foods, which is why it’s so important to read ingredient labels to avoid them! No problem at all Becki! So glad you found this post helpful! Nitrates and Nitrites while theoretically bad, haven’t actually shown to be bad in experiments on humans or animals. Therefore it is a scare, not a fact. Hi Garry – Actually it has been proven in multiple studies that when nitrates and nitrites are added to meat (which has amino acids in it since meat is high in protein), which is then cooked, the nitrates/nitrites form Nitrosamines – which is a carcinogenic compound. Nitrates/nitrites need both amino acids and high heat cooking to form Nitrosamines – but since that always happens with meat – it is always problematic for them to be added to meat. Scroll down to the bottom of this article to read more about this topic. Love this post! So true that when we stick to real, whole foods as the majority of our diet, we will be in the right place. I recently wrote about this as well, and found an article that found that 57% of what most people eat is ultra-processed foods! Love Dr. Hymans work, too. Thanks Teresa – that’s exactly right! Sticking to real whole foods is the best strategy to avoid a lot of the marketing traps with processed food! Do you really find that all the whole foods are around the perimeter of your store, and all of the bad foods are in the aisles? I’ve often seen this advice and wondered if it is more true of other supermarket chains than Giant Eagle, the major chain here in Pittsburgh. All of their stores are arranged differently. In my nearest store, here’s what’s around the perimeter: produce, bakery, prepared foods, fancy cheese and deli meats and salads, meat, bread, crackers, cookies, ice cream. You have to go into some of the aisles to get beans, frozen vegetables, nuts, oatmeal, or any dairy products. In other Giant Eagles, the one constant is that produce is near the entrance—but in their larger stores, that’s not the perimeter; along the side wall next to the produce section is the deli or bakery. Hi Becca! That’s a good/interesting point – I suppose some stores probably do it differently! 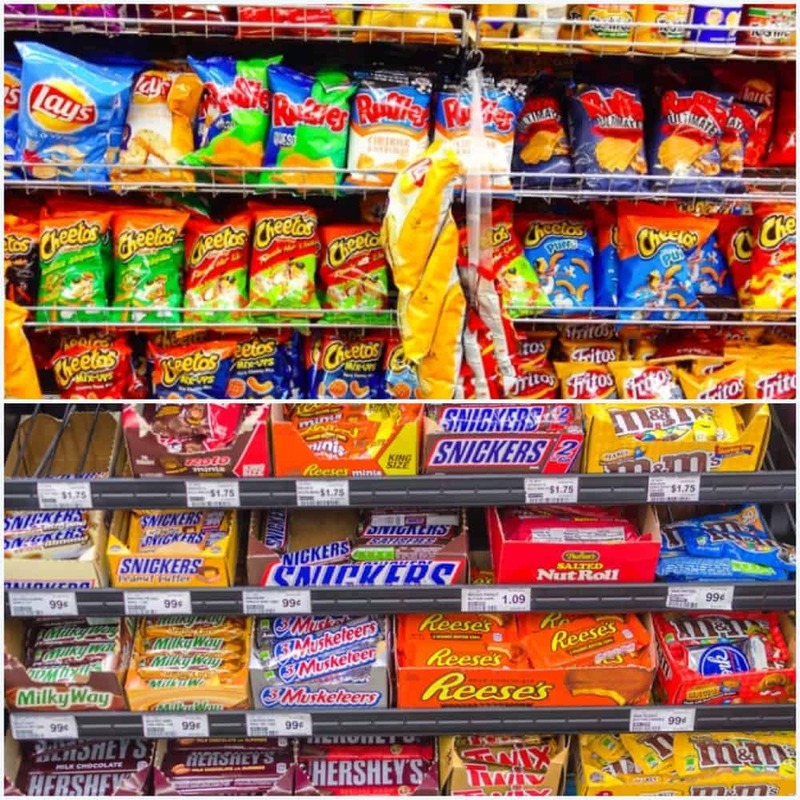 In general it is a good rule of thumb in that the processed food is more likely to be in the center of the store vs. in the perimeter, but probably doesn’t apply to every store out there! Thanks for sharing that chart too! This is a great article. Thanks for also listing what each ingredient does and why it is used by manufacturers. Great info. I always say, knowledge is power. Exactly!! It’s so hard to make the right healthy food choices if you don’t know exactly what the food manufacturers are doing with the ingredients they add to your food! I hope this helps shed some light on how to navigate those confusing marketing messages on foods at the grocery store! Great post! I did not know that about enriched flour. Thanks so much for this info! Where can I get your recipes in Mexico? Hi Mario! You can access all of my recipes on my blog right here! My blog is accessible in Mexico 🙂 Let me know if there are specific recipes you have questions about! Excellent article. Consumers need to be more informed about harmful ingredients. It’s great that you not only outlined the ingredients but indicated why they are harmful to the body. I believe that armed with this knowledge, consumers will be more willing to avoid foods with these harmful substances. I completely agree Rose!! It’s crazy some of the processed ingredients that are in our food. I’m so glad you found this post helpful!